Without a doubt, Lee Gajda was one of the original practitioners within the American designer toy movement. Having met Frank Kozik through his band poster artwork at the time, Gajda was first exposed to the so-called “urban vinyl” phenomenon during a visit to Kozik’s San Francisco studio in 2001. And Gajda quickly began looking at these Japanese produced works as sculptural canvases, altering their intended decoration into an expression of his passions and interests, including the tattoo, hot rod, skateboarding, graffiti, and comic cultures. To put this into perspective, it wouldn’t be until the following year that Paul Budnitz opened his Kidrobot store at the corner of Haight & Ashbury, his first customer purportedly a then-unknown Huck Gee. And yes, this means that by the time Kidrobot produced their debut Cheech Wizard piece in 2003, Gajda had already been an ardent and established artist within the designer toy movement. A decade into his career, for which he used his childhood nickname of Leecifer as an alias, Gajda’s first original vinyl sculpture, Honoo the Flame, was produced by Super7 but this didn’t deter the artist from his roots of hand-painted others’ forms. In fact, later that same year, he undertook the massive endeavor of decorating a collection of Google‘s Android™ mascot figures, the resulting works collectively titled as his Custom Android series. 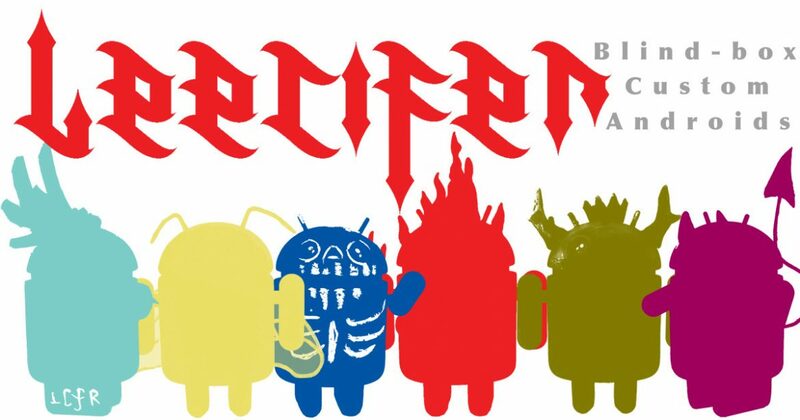 Issued on July 15th of 2011 at midday Pacific time exclusively through the retailer Dragatomi, Gajda’s Custom Android series was reportedly completely claimed by collectors in under three minutes. Comprised of sixteen hand-painted pieces in total, this series included only six designs, several of them painstakingly replicated by the artist multiple times. With each piece remaining individually unique due to the process of being decorated by hand, many of the works featured specially sculpted aspects from the artist, his signature drybrush painting technique leaving its characteristically scratchy brush strokes on the Dyzplastic-produced forms. As each piece was randomly packaged, lucky collectors received their carefully mailed box, its contents a mystery. Upon opening the boxes flaps, one was greeted by bagged pins and stickers, but digging through a small sum of packing peanuts revealed the true prize, one of Gajda’s Custom Android creations. Enclosed could be the feminine and operatic Valykrie Droid or the majestic and mythologically grand Forest King, the horned and sharp-tailed Imp Droid or the vibrantly undead Skele Droid, the flame-covered Honoo Droid or even the cartoonishly cute and delicately winged Bee Droid. But whatever that fortunate connoisseur claimed for their own, they surely couldn’t help but be impressed by the diversity of this series’ possibilities. While each design included was clearly an expression of the same fabulist’s hand, Gajda’s impressive imagination had summoned forth a breadth of creative creations.